Talyn is an average wolf, he has no special powers or abilities. Talyn is an eternal optimist, he rarely thinks on bad things. he's also prone to occasional derping, when he does get angry his outbursts of anger are brief and loud. his fur is a warm/cool gray depending on seasonal coat, his forearms are have white glove markings and his feet are adorned with white 'toesock' markings, beneath his eyes are white arrowheads that his eyes rest in, the back of his ears a re black/dark gray which are also seasonal dark gray in summer black in winter. in late spring and summer Talyn tends to be quite slim and athletic in build while in winter his body thickens out as he puts on weight for the colder periods. if he's clothed he usually wears loose comfy clothing and tends to not care for fashion. most of the time he's a casual nudist. 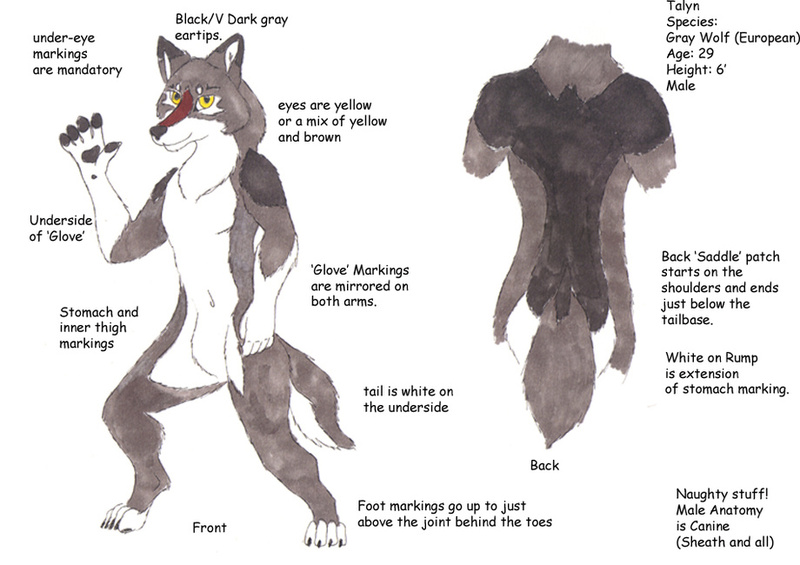 after my original refsheet in 2008 was done I finally got around to making a new one, that and it was an excuse to use my new markers.